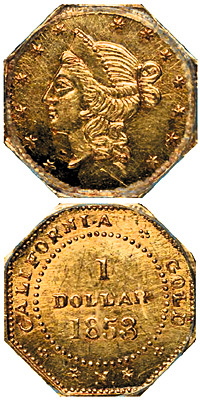 California fractional gold coins in $1/4, $1/2 and $1 denominations were minted during the Gold Rush when federal coinage was scarce. Exonumia. It isn't a disease, and there's no shame in being bitten by the bug. Some people are exonumists and don't even know it. Or are they exonumismatists? Either way, the word ("exo" meaning "outside of" and "numis-" meaning "coin") pertains to the study and collecting of things that aren't quite coins — i.e., tokens, which are used in commerce or barter and generally have a stated denomination; and medals, which commemorate an event and aren't used in trade. Tokens have a long history in California. Some of the best known and dearest examples were made during the gold rush when federal coinage was scarce. Private companies melted gold dust into tiny $1/4, $1/2 and $1 pieces from 1852 to 1856 to facilitate commerce in the West. Production resumed in 1859, primarily for souvenirs. Either round or octagonal, most early pieces depict the bust of Miss Liberty, but they were heavily counterfeited in the 1900s (and anything showing a bear is fake), so be careful if you're offered one for sale. Nothing quite so exotic hails from the Santa Clarita Valley, but there are some highly coveted pieces. Exonumia of the SCV can be divided into two groups: fairly common and collectible, and so scarce you're not likely to enounter one. The latter group consists of six known saloon tokens issued from about the 1880s to the 1910s. Known examples were issued by the Oil Exchange bar in Newhall (two types), Nick Rivera's saloon in Newhall, S.P. Moore's Pool Hall in Newhall, and A. Staudy's (alternately Stauty's) pool hall (two types) in Newhall. All of these are belived to be unique — in other words, there's probably only one example of each in existence in the world. This writer once held them in his hands. By the rim, of course. Unfortunately their owner wanted them back. Fortunately he allowed them to be photographed first. The other group of SCV exonumia is far more common and collectible ("common" simply meaning you can find them, not that they're unworthy). These were the tokens and medals issued by local businesses and community groups, particularly for the SCV's Fourth of July celebration in the 1940s and 1950s, but also as souvenirs from places like Callahan's Old West on Sierra Highway and from performers such as Cliffie Stone — as well as a varied run of souvenir medals from Magic Mountain throughout the 1970s. These tokens and medals offer a nostalgic window into the period. Although many appear in collector guides (particularly the early ones, which are listed in Charles V. Kappen's standard reference on California tokens), there is no comprehensive listing of local exonumia, so this discussion is limited to the items the writer has encountered. Also, some exonumists include other para-numismatic materiel in their discipline, such as badges, buttons, patches, pins and ribbons — but there are too many of those to include under this heading.